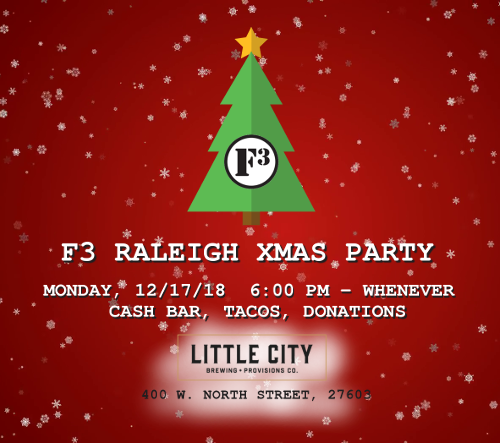 The party will again be hosted at Little City Brewing, at 400 W. North Street, Raleigh, NC 27603! Just like last year – the venue will be specially reserved for you and your F3 pals. It’s a 2 bar setup (cash bar) with a taco/guacamole bar as well. The party’s total cost is $2,000 just as it has been the past two years. This is not a fundraising effort, but we would really appreciate collection donations to recoup the cost of the venue and food. Click here to check out online, using PayPal. In addition, we will be collecting new or gently used coats, sweatshirts, hats and other cold-weather clothing for our brothers at Healing Transitions. Please bring your donations tonight! We’ve started raising money already – check out our progress below!